574 pages | 149 B/W Illus. Ancient civilizations and cultures—Mayan, Aztec, Mesopotamian, Indus, and Yangtze—were built on good soils, surviving only as long as soils had the capacity to support them. In the twenty-first century, productive soil is still the engine of economic development and essential to human well-being. The quality of our soil resources, however, is threatened by human-induced and natural perturbations. World Soil Resources and Food Security takes an in-depth look at the availability and status of soil resources in the context of the growing demands of an increasing world population and rising expectations of living standards. This timely reference presents current information on the soil resources available for food production. Presenting innovative strategies for soil and water management, it discusses how to maintain or improve the world’s soil resources in order to increase food production. With the majority of the world’s 1.02 billion food-insecure people concentrated in South Asia and sub-Saharan Africa, several chapters focus on soil resources in these regions. The book concludes by outlining the need for further research to generate credible data on soil resources and degradation. 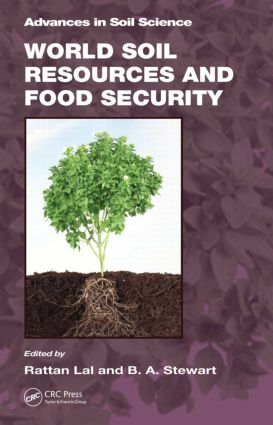 This volume is a useful resource for those interested in the state of the soils of the world in relation to food security and environmental quality. Rattan Lal is a Distinguished University Professor of soil physics in the School of Environment and Natural Resources and director of the Carbon Management and Sequestration Center, Food, Agricultural, and Environmental Sciences/Ohio Agriculture Research and Development Center, at The Ohio State University. Before joining Ohio State in 1987, he was a soil physicist for 18 years at the International Institute of Tropical Agriculture, Ibadan, Nigeria. Professor Lal’s research interests include erosion-induced changes in soil quality, soils and climate change, soil compaction, conservation tillage, mine soil reclamation, water table management, and sustainable use of soil and water resources of the tropics for enhancing food security. Professor Lal is a fellow of the Soil Science Society of America, American Society of Agronomy, Third World Academy of Sciences, American Association for the Advancement of Sciences, Soil and Waste Conservation Society, and Indian Academy of Agricultural Sciences. He is a member of the United States National Committee on Soil Science of the National Academy of Sciences and a recipient of several awards, including the International Soil Science Award of the Soil Science Society of America and the Liebig award of IUSS. He is a recipient of honorary degrees from Punjab Agricultural University, Ludhiana, India; Norwegian University of Life Sciences, Aas, Norway; and Alecu Russo University, Moldova. B.A. Stewart is a distinguished professor of soil science at the West Texas A&M University, Canyon, Texas, and the director of the Dryland Agriculture Institute. He is a fellow of the Soil Science Society of America, the American Society of Agronomy, and the Soil and Water Conservation Society. He is a recipient of the Unites States Department of Agriculture Superior Service Award, a recipient of the Hugh Hammond Bennett Award of the Soil and Water Conservation Society, and was made an honorary member of the International Union of Soil Sciences in 2008. Dr. Stewart is very supportive of education and research on dryland agriculture. The B.A. and Jane Anne Stewart Dryland Agriculture Scholarship Fund was established in West Texas A&M University in 1994 to provide scholarships for undergraduate and graduate students with a demonstrated interest in dryland agriculture.